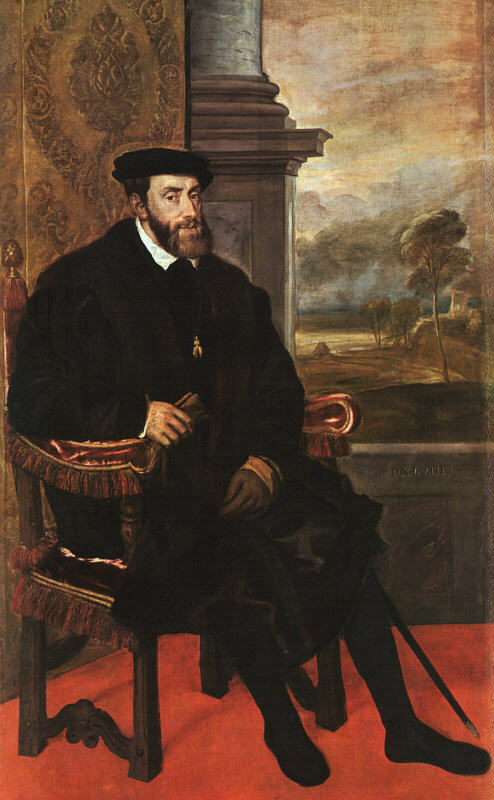 In the early 16th century the balance of power in Western Europe was a precarious one; the major players being Francois I of France and Carlos V, Holy Roman Emperor. Each monarch tried to build a set of alliances to swing the balance in their favour. Into the mix came England, under King Henry VIII of England. Henry's chief advisor, Thomas, Cardinal Wolsey, favoured an alliance with France. Henry's queen, Catalina of Aragon, favoured the Empire (the Emperor Carlos was her nephew). Yet Henry and Catalina's daughter Mary was affianced to Francois's son, the Dauphin. 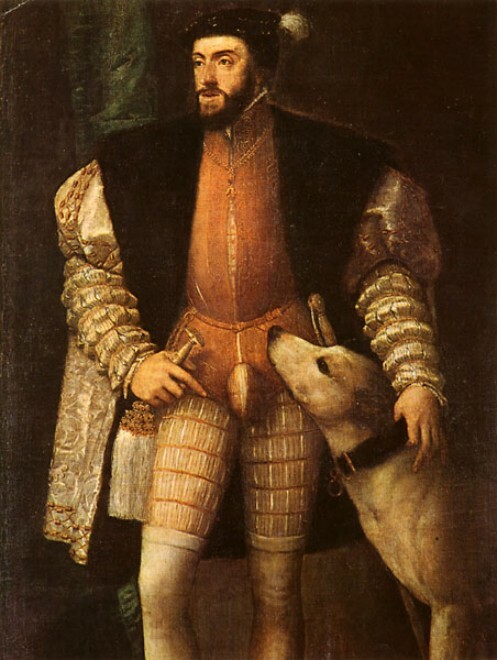 Henry himself was undecided as to which alliance offered him the best chance of personal and national gain. He played a waiting game in an attempt to stay on good terms with both Carlos and Francois, hoping perhaps that no matter which monarch gained the ascendancy, England would benefit. In 1520 Henry was persuaded to forge an alliance with France. A meeting was arranged between the two monarchs at a location just outside Calais, a bit of unremarkable countryside between the villages of Ardres and Guines. Henry VIII, his wife, Catalina of Aragon, and virtually the entire English court traveled across the English Channel for a meeting with King Francois I of France, for the purpose of establishing a political alliance. These two monarchs were rivals, both politically and personally, and each prided himself on the splendour of his court. When it was determined that the castles of both villages were in too great a state of disrepair to house the courts, they camped in fields, Francois at Ardres and Henry at Guines. Even the valley in which the two kings met was artificially levelled so that neither of them would have an unfair advantage over the other! This was no ordinary camping expedition; huge pavilions were erected to serve as halls and chapels, and great silken tents decorated with gems and cloth of gold. Each camp occupied about 2.5 acres (1 hectare) of land, and included a large pavilion to serve as a great hall, another for a large chapel, and numerous gilded tents to house the kings’ enormous retinues (which numbered in the thousands at both camps). The silken tents were richly decorated with cloth of gold and precious gems, as were the throngs of courtiers and ladies in waiting. A temporary gilt fountain was built, with three separate spouts for claret, spiced wine, and water. Some idea of the size of Henrys following may be gathered from the fact that in one month 2200 sheep and other viands in a similar proportion were consumed. In the fields beyond the castle, tents to the number of 2800 were erected for less distinguished visitors, and the whole scene was one of the greatest animation. Ladies gorgeously clad, and knights, showing by their dress and bearing their anxiety to revive the glories and the follies of the age of chivalry, jostled mountebanks, mendicants and vendors of all kinds. It is this ostentatious display of wealth and power that earned the meeting-place between Francois and Henry the sobriquet "The Field of the Cloth of Gold". Journeying from Calais Henry reached his headquarters at Guines the 4 Jun 1520. 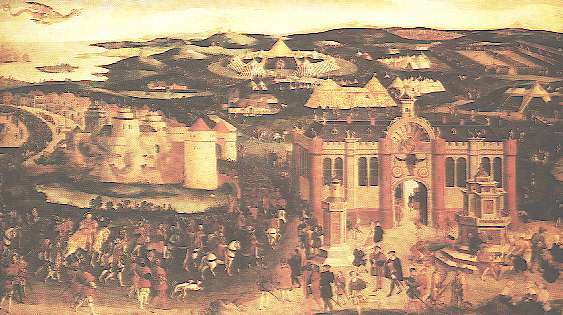 The meeting lasted for three weeks (7 Jun - 24 Jun 1520), during which time each court strove to outdo the other in offering splendid entertainments and making grandiose gestures. Masterminded by the great Cardinal Wolsey, each king and Court strove to outshine the other. After Cardinal Wolsey, with a splendid train, had visited the French King, the kings first met at the Val Dor, midway between the two camps, on 7 Jun. The subsequent meetings and entertainments were conducted with much apparent cordiality, although "many persons present could not understand each other". Feasts and jousts were held, including a tilt between Henry and Francois themselves. There were processions, masques, balls, banquets, sporting events, and even fireworks. Queen Catalina sat beneath a canopy of estate entirely lined with pearls to watch her husband and King Francois joust against one another. Each day the monarchs and their entourages appeared in more sumptuous and elaborate costumes. The expense incurred by both monarchs was enormous, and put tremendous strain on the finances of each country. Henry was accompanied by 5,000 people and spent in excess of £13,000 on the splendour of the occasion. Among those attendants were ten chaplains, and one of them was John Taylor. The King ordered each priest to be clothed in damask and satin and each to be followed by his own attendants, not exceeding ten persons and four horses. The English built a splendid pavilion, a temporary palace of wood and canvas, with ‘windows upon windows upon windows’. The Flemish glazier Galyon Hone created the windows. Fine malmsey and claret flowed from two drinking fountains. One morning, King Francois rose early and, without telling any of his nobles, he rode quite alone to the English camp. Henry was still in bed when Francois came into his room and said, laughing, "My dear cousin, I come to you of my own free will. I am now your prisoner". Henry was very pleased to see that Francois trusted him so much that he was not afraid to come quite alone like this. He sprang out of bed and threw a chain of gold round the French King's neck. In return Francois gave Henry a beautiful bracelet, and then, laughing and joking like a schoolboy, he insisted on helping Henry to dress. He warmed his shirt, helped him to tie and button his clothes, and then, mounting on his horse, rode gayly home. When he came near his castle he was met by some of his nobles, who were anxiously looking for him. Francois laughingly told them what he had been doing. "Sire, I am very glad to see you back again..." said one of them, "But let me tell you, master, you were a fool to do what you have done. Ill luck be to him who advised you to do it." "Well, that was nobody, the thought was all my own." replied Francois. After Wolsey had said mass the two sovereigns separated on the 24th. Yet for all the trouble they went to, the results of the meeting were negligible. Though Henry and Francois agreed in principle to an alliance, it was just two weeks later that Henry met with Carlos himself in England. By the terms of this new treaty between England and the Empire, each agreed to not sign any new treaties with France for two years, and the betrothal of Mary to the Dauphin was broken in favour of a new betrothal to Carlos himself. 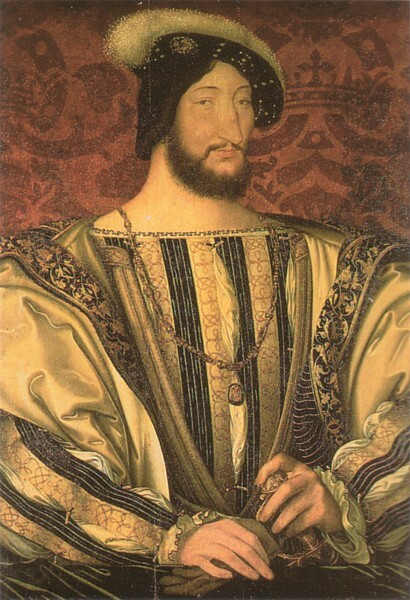 Two years later King Henry declared war on France, and his ally, the Emperor Carlos, did likewise soon afterward. Nevertheless, by 1525, the betrothal between Mary and Carlos had been broken also, and a new treaty had been arranged with France. 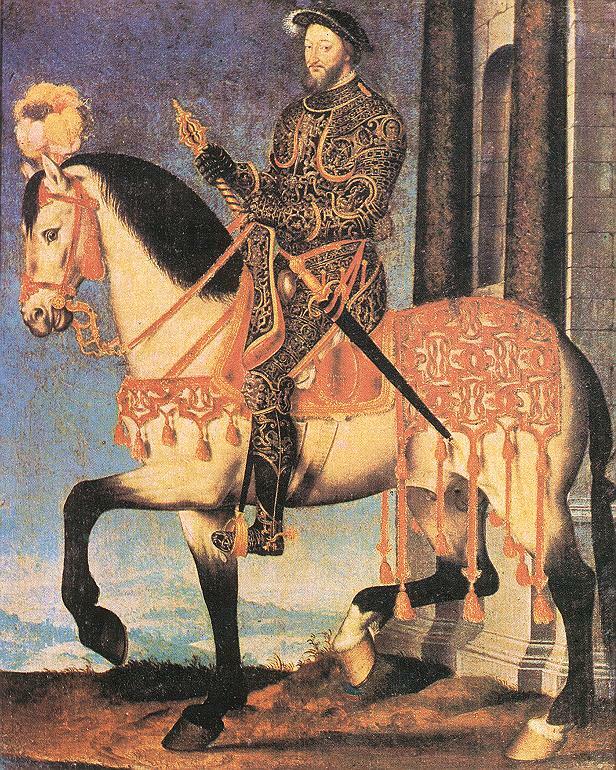 Throughout his reign, Henry continued to manipulate these two powerful monarchs, and to be manipulated by them, as each jockeyed for political ascendancy in Europe. The Field of Cloth of Gold had a negligible impact on these political machinations, but it made a great impression on those who were witness to such splendor.